On a hot night like this it is hard to think of cooking, or even standing over a grill ….. in fact standing and rolling cold items like sushi seemed a bit of a stretch …. this was just perfect – so cold and refreshing and really hit the spot. Give it a try with any of your favorite sushi ingredients. Great for a family too – serve it the way I did – on a large platter and let each person make their own bowl up as they go. Heat again on a gentle boil for about 3 minutes until it thickens slightly. Taste!!!! I can’t say this enough …. you need to make sure the flavours are balanced, playing with each of the simple ingredients above. If you think it can stand a bit more citrus, add in the zest. If you like your sushi spicy, add in either wasabi paste or a minced chili pepper. Toast nori sheets lightly, just until crispy. Slice in thin strips, and again dice if you like small pieces or leave it in strips. But really – use whatever you like! Put a little rice in the bottom of your bowl, assemble a few of each of the ingredients and lightly drizzle with the sushi sauce – have fun – you will love it! 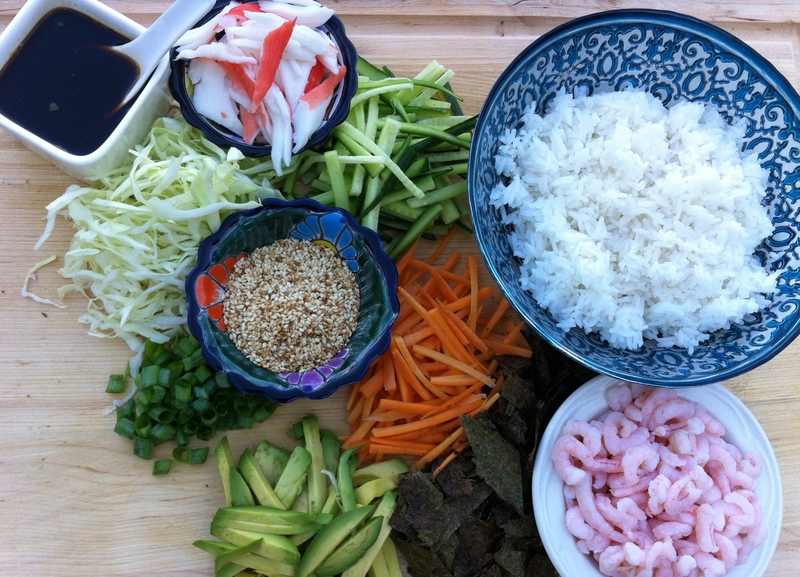 This entry was posted in Appetizers, Asian, Beef and Pork, Chicken, Japanese, One Dish Wonders, Recipes, Salads, Vegetables and tagged cabbage, carrot, crab meat, cucumber, main dish, one dish meals, rice, salad, shrimp, sushi, sushi bowl by Chatty Kathy. Bookmark the permalink.